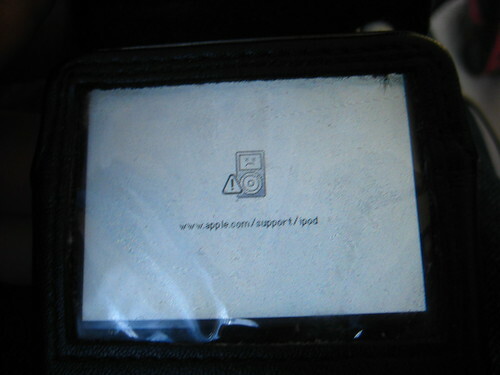 I didn’t know that iPods could get altitude sickness, but my iPod has been pretty sick ever since I arrived in Tibet. I’ve got a fifth generation 60GB Video iPod, and whenever I get above about 3,500 meters in elevation (a little over 10,000) feet, it wonks out. Its poor hard drive starts making those repetitive clicking sounds, a noise that I’ve learned to fear, because it is the harbinger of a failed hard disk. Soon after, the menu is replaced with the “sad iPod face” you see above. And I immediately shut it off to keep from damaging my precious ‘pod. My iPod has a hard time functioning in Lhasa (elevation 3500 meters), taking longer than normal to load songs. If I go even a few meters higher, it conks out entirely, and the dreaded clicking noise begins. I’ve decided that I’m going to leave my iPod off until I arrive at lower ground. I couldn’t imagine spending the rest of this trip with no music! lol Many people feel Brazilian Jiu Jitsu is absolutly the best type of grapling, one thing that karate lacks. After exploring a hunfdal of the articles on your web site, I trulyappreciate your way of writing a blog. I bookmarked it tomy bookmark webpage list and will be checking back soon.Please check out my website as well and let meknow how you feel. I would recommend this method of transport because of the fact you can adjust to the highr than normal altitude. Putting money back in the pockets of the Tibet people. It is also an amzing spirtual journey for many.